Soon or later you have to realise it can be quiet tricky to navigate around a food/cooking blog, if you do not have a entire recipe overview. So I have been working on such a recipe overview, where you easily should be able to locate recipes, which I have testing once or several times in my little kitchen. You can find the the recipe overview here. Thank you very much to those of you, who participated in my second little voting about which type of muffin I should bake for a picnic row this Sunday :-) I really appreciate, that you took the time to and helped me with the decision with in the area of muffin baking. As you see it was a dead end between squash and chocolate, so as apple got one vote, I decided to go for the vegetable/fruit version. So your return of investment (= voting without tasting), is that I am sharing the recipe with you, while the picnic row is on-going !!! 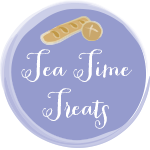 These cookies are being forward for the monthly blogging event Tea Time Treats having the theme of muffins, fairy cakes and cupcakes Tea Time Treast is managed by Karen from Lavender and Lovage and Jane from The Hedge Combers. Whip brown sugar and eggs foamy. 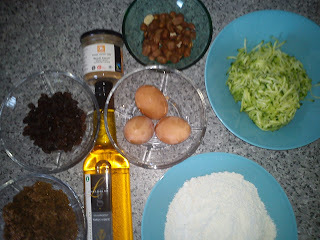 Add the oil and whip further. 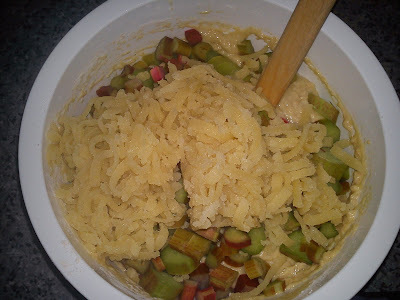 Add grated squash, cinnamon, nutmeg and salt and whip again. Add flour and baking powder and whip the muffin dough into a homogeneous mass. 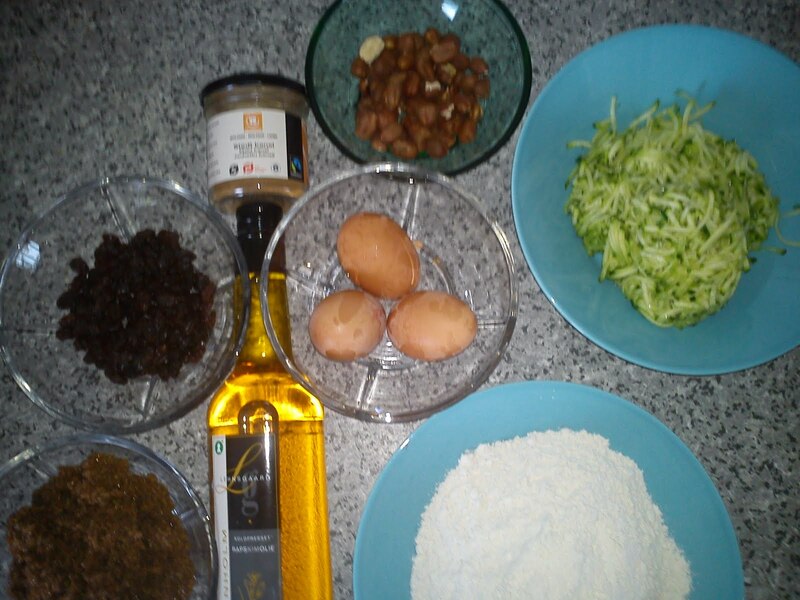 Stir in the minced hazelnuts and raisins. Fill the dough into the muffin forms. 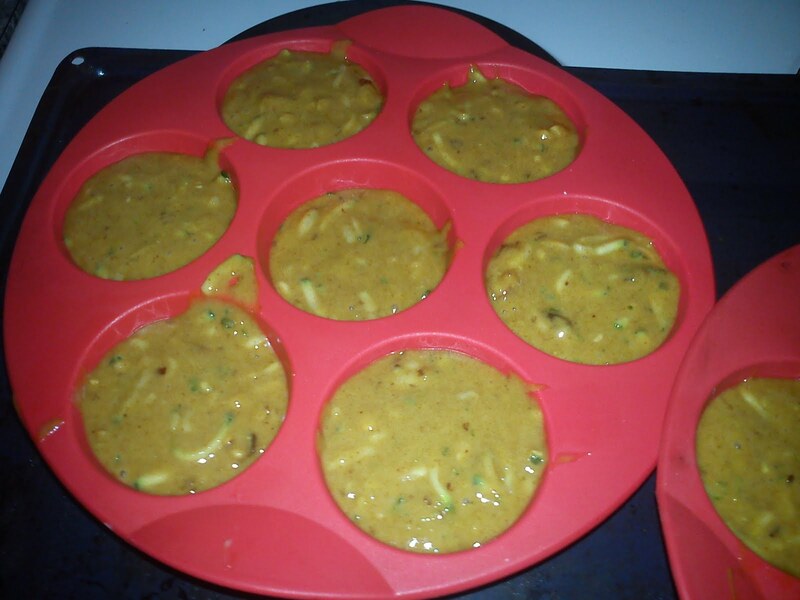 If you have more muffins, that needed, when place the hot muffins in the freezer at once. 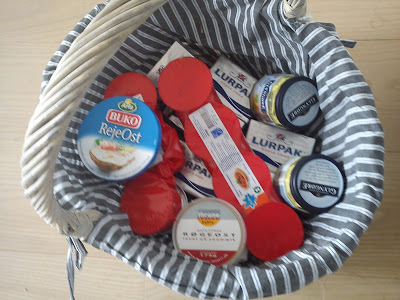 ﻿Yes, I was bringing various Danish food stuff with me to Switzerland, but I also returned with different food from as souvenirs instead of the usual T-shirt or plastic stuff, as eating the food at home remind you again of a good vacation. The milk chocolate from Cailler has already disappeared into my stomach ! I find it to be great combination of caramel and salt. 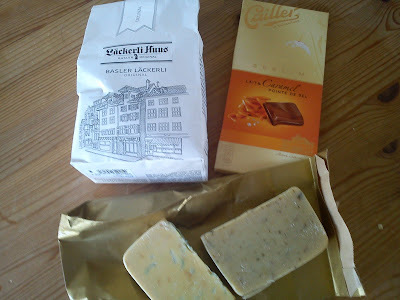 The Swizz biscuit from Basler Läckerli is still surviving in my kitchen, it reminds me off the German style of lebkuchen, uhm :-). 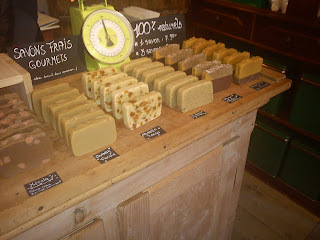 In Gruyère I found some home-made soap, which really looks like slices of cake !!! 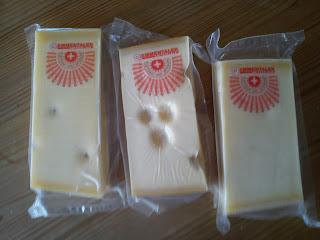 From the visit to the Emmental dairy I brougth three different type of Emmental cheese, a mild version stored for 6 months, a medium version stored for 12 months and a stronger version stored for 18 months. I am really looking forward to taste these different matured Emmentalers. 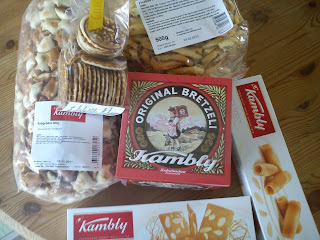 From the Kambly biscuit factory I brought a collection of both sweet and savoury biscuit including some biscuits in traditional style metallic tin. I can simply not refuse these marketing offers in form of package deal in form of the food stuff in question combined with a metallic tin. I always end up buying these food offers !!!! 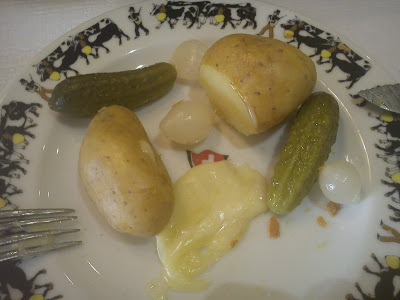 While visiting the chocolate factory Cailler, we decided to continue to the small village Gruyere close by, where the two most popular dishes on the different menu cards contains cheese, which is cheese fondue and raclette. 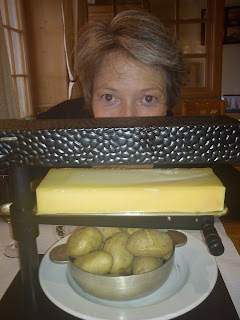 At the time being I was not ready to cheese fondue, so we decided to try raclette, raclette is as well as Swiss cheese. The cheese is placed under a heating devise, to the cheese can melt. 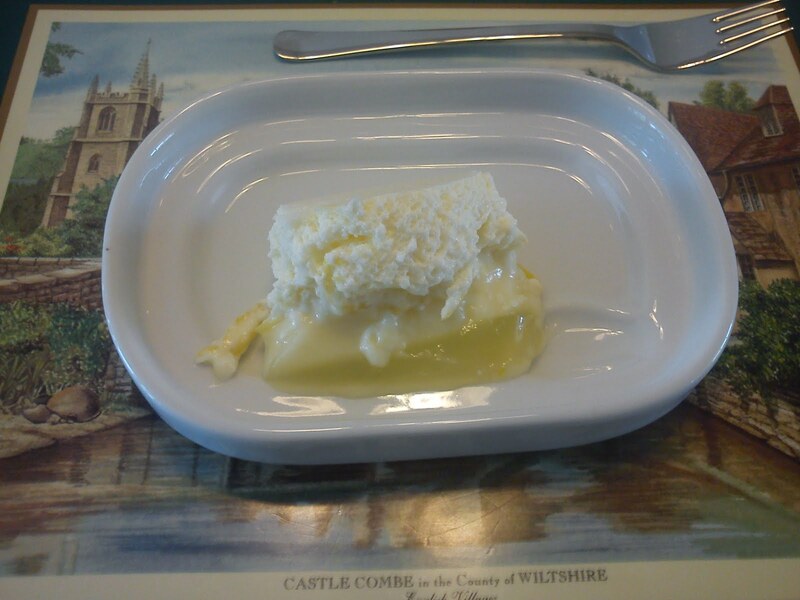 You will when use a knife to remove the melted part of the cheese and transfer it to your plate. You are eating the melted cheese together with boiled potatoes, pickled onions and gherkins. 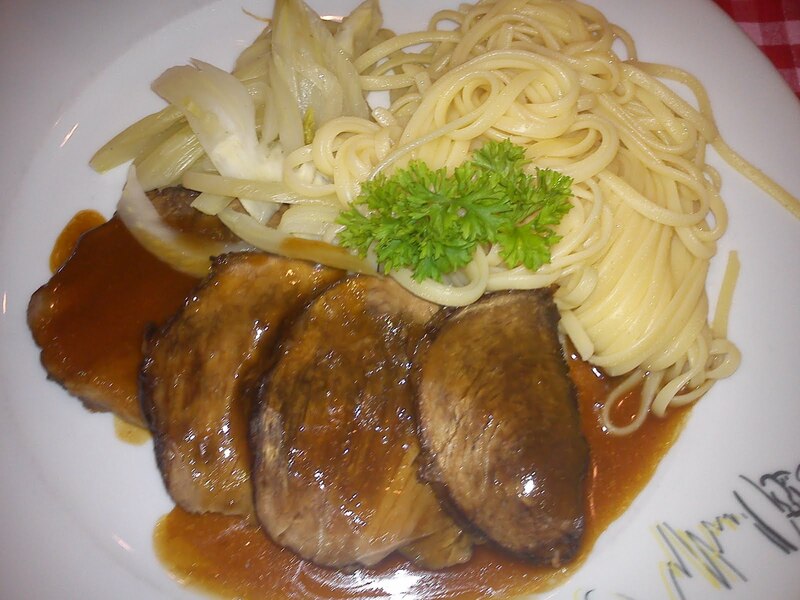 It was a good tasting traditional Swiss dish. 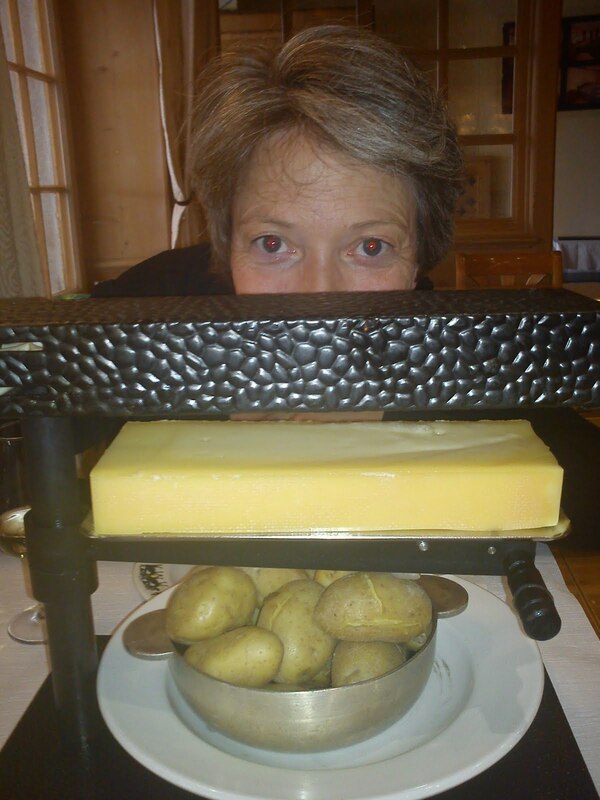 And now I believe, I am ready to try cheese fondue next time I am in Switzerland ! 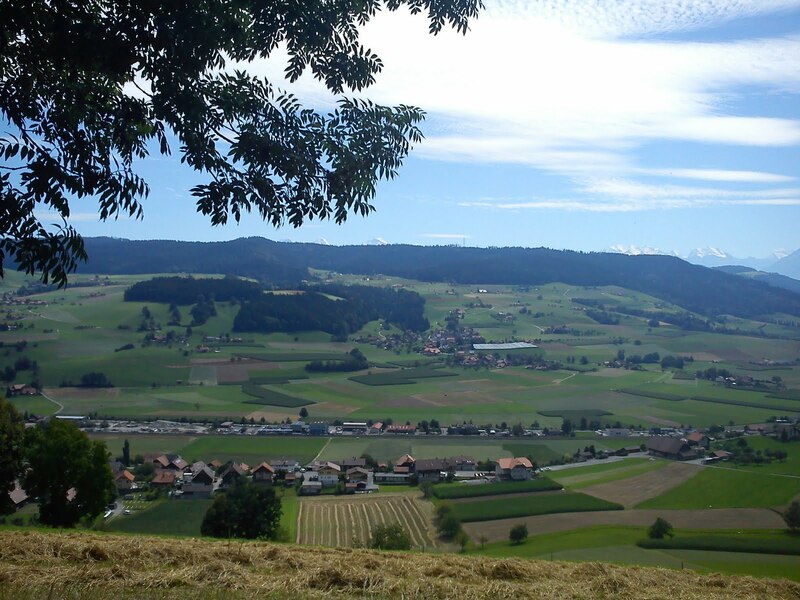 Many places in Switzerland you have the feeling of being placed in-side the motive of a puzzle with blue sky, mountains dressed with green forest and some of them having a "white top hat" on (in form of snow), small villages and off cause the Swiss cows. 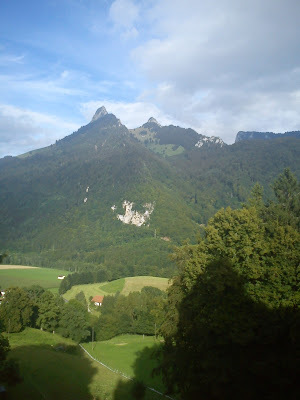 I am still searching for the purple cow called Milka. Say cheese :-) During my summer vacation in Switzerland my friend and I visited a show cheese dairy producing Emmentaler cheese, so naturally this dairy is located in the valley of Emmental !! 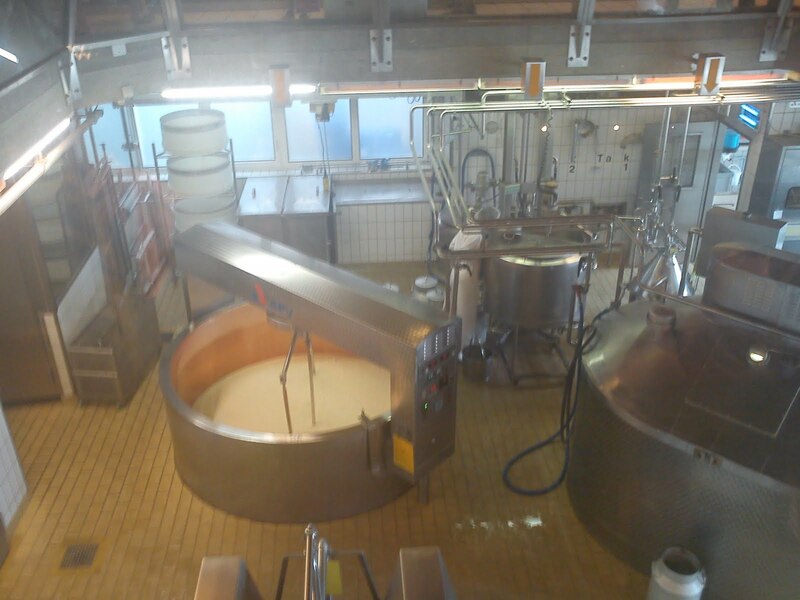 In this show dairy you can see most of the entire production involved in the making of Emmetal cheese. 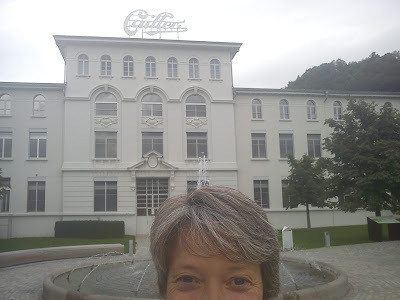 It is really a great place to visit, where you get an introduction to the many interesting details involved in cheese production both oral and visual. 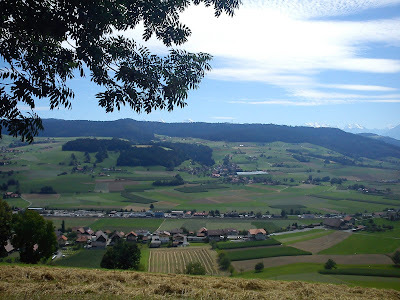 ( http://www.emmentaler-schaukaeserei.ch/de/home.html). 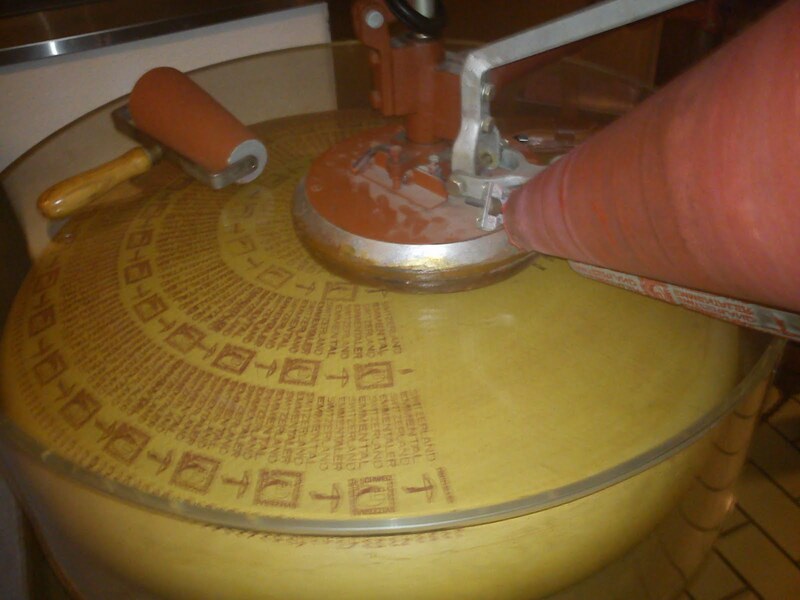 As example each Emmental cheese weighs 73 kg and requires 1000 l milk to make, so it a gigant cheese volumen. 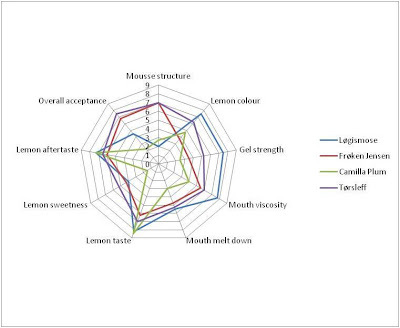 Most cheese weighs between 6-10 kg. 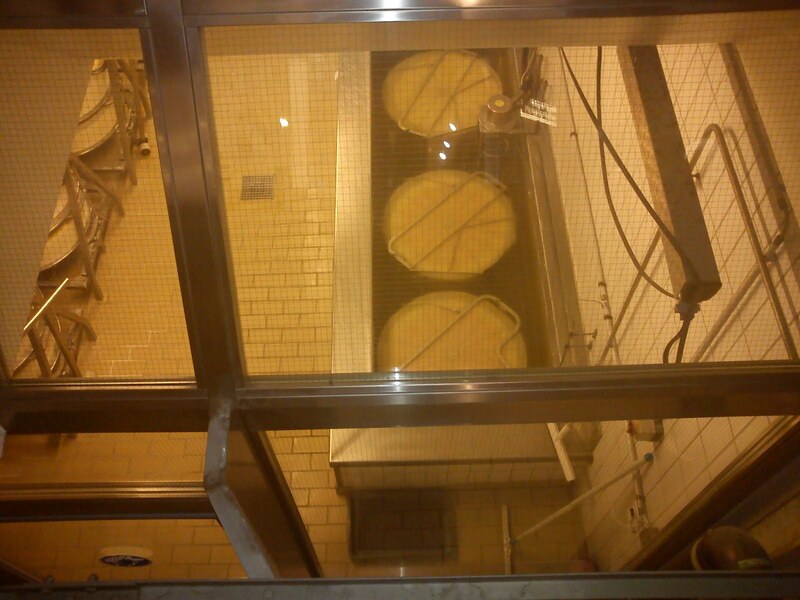 In the picture above you can see the big cheese vat, where the liquid milk is turned into cheese grains. 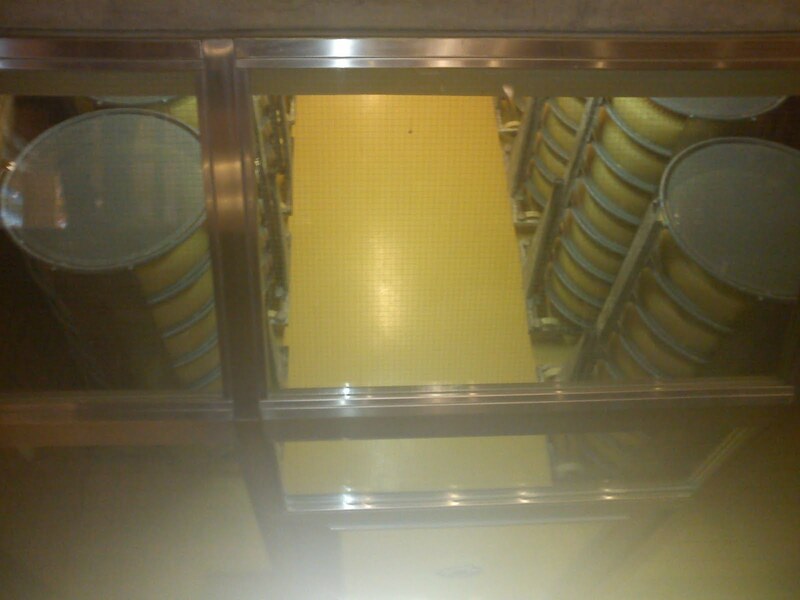 Below you can see the cheese press, where the small cheese grains is pressed together to one big Emmental cheese of 73 kg. After pressing the Emmental cheese undergoes salting, where the entire cheese in place in a salt brine. Equipment for marking the cheese with name and it's production details used for tracking the production later during the storage of the cheese. 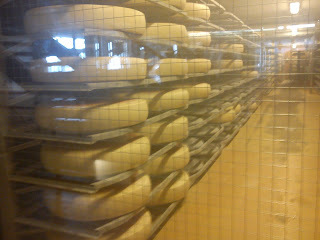 The storage of Emmental cheese, where the cheese is maturing. 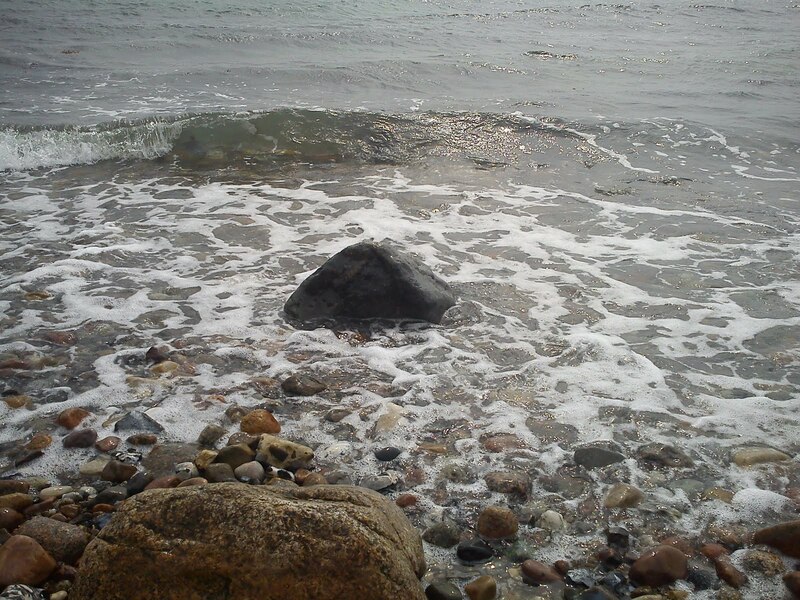 Maturing time is between 6-18 month. 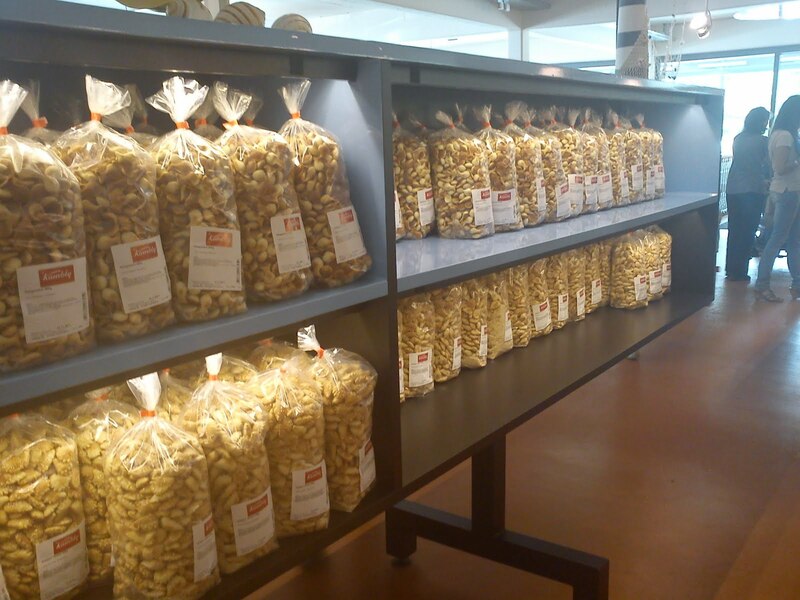 The longer storage time, the more taste in the cheese. All in all it was a very interesting to visit. 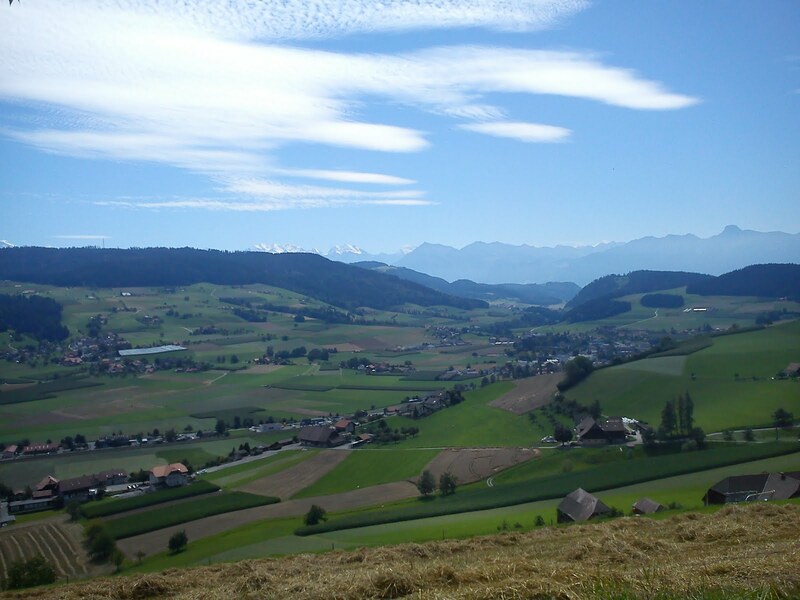 And we have located another four show cheese dairies in Switzerland, where you can experience the production of other AOC cheeses from Switzerland such as Appenzeller and Gruyère. Does this plate of various cheese and meat not look great ? 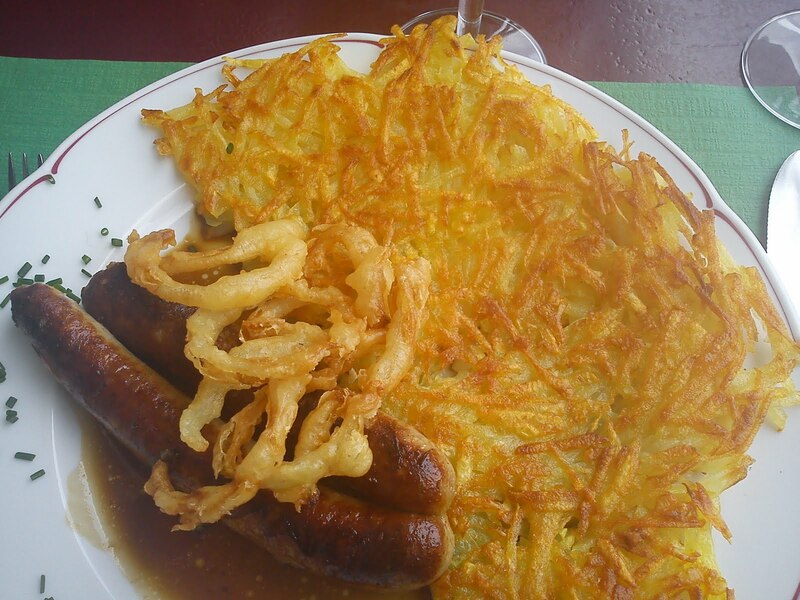 This selection is some of the food, which you can get at the local inns in Switzerland for lunch. 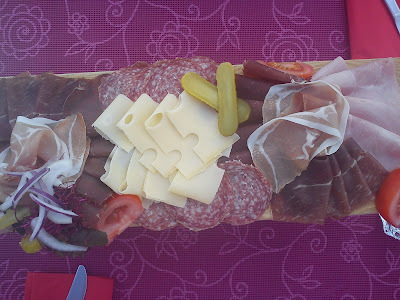 It was tasting great and is served together with bread and butter. 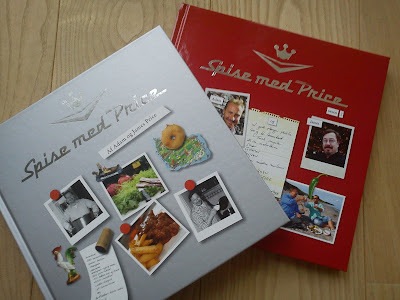 While I was shopping this evening I found these two cooking books (Spise med Price) on offer in Kvickly to 100 DKK(13.25 €) per book. I am a big fan of the TV cooking series with the two Prices brothers and their use of butter (plenty of butter), the humor, the different themes and the many funny details. You can still use your "voting right" to decide, which type of muffin I should bake for the coming picnic row this coming Sunday. 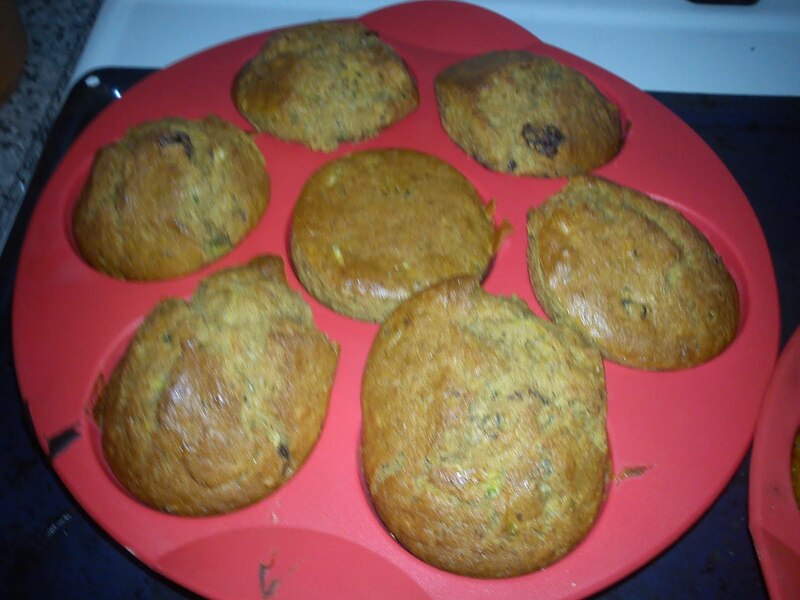 At the time being it is dead heat with equal votes between the squash and chocolate muffin. At my first attempt on eating lunch at Landgasthof Löwen (http://www.loewen-grosshoechstetten.ch/01-willkommen.html) in Grosshöchstetten during my summer vacation in Switzerland I was unlucky, as this inn/pub is closed between Wednesday - Friday afternoon. And I was hungry on a Thursday !!! Grab a biscuit or grab two hand fulls of different biscuits !!! 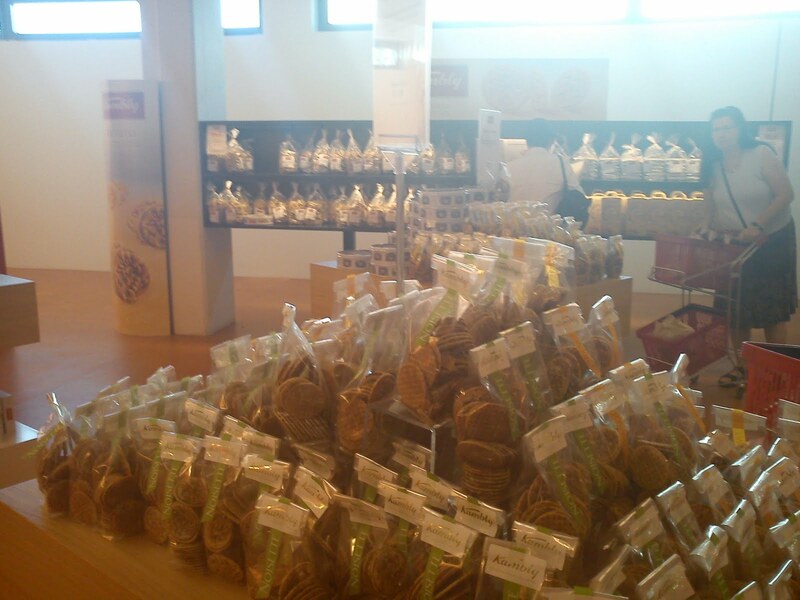 One big shop only selling biscuits of all different sort. Sweet biscuit with or without dark or milk chocolate, fruit filling or the savoury kind with cheese or salt. 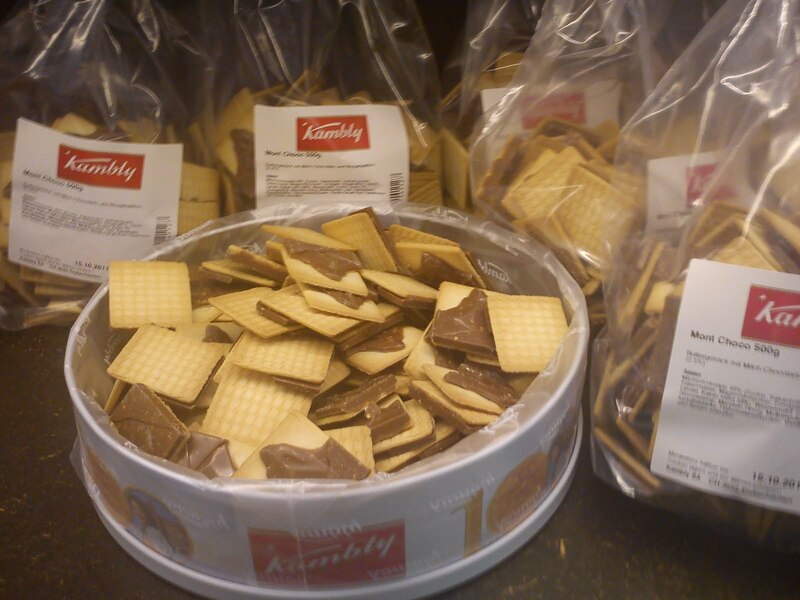 You can taste all the many different types of biscuits produced by Kambly in their factory shop, before you make your decision on, which biscuits, you would like to buy and bring back home to your little kitchen. 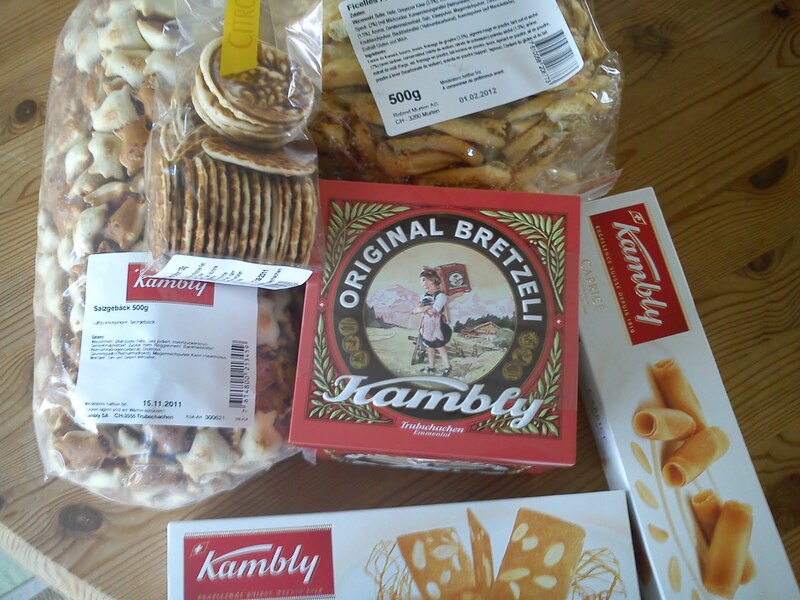 Besides from visiting a chocolate factory in Switzerland, we were also visiting the biscuit factory of Kambly. Next Sunday I will participate in a picnic row on the Fjord of Vejle, where we are planning to row from the rowing club in Vejle to the entry point of the fjord (Trelde Næs) on the southern side and return. 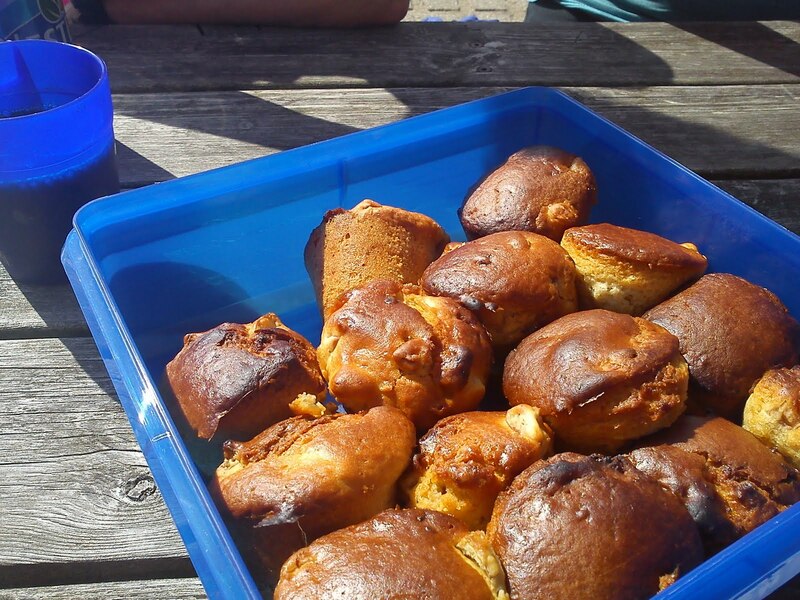 So I assume we could need a muffin some time on this picnic row with a rowing distance of 52 km in total ! Therefore I need your help selecting, which type of muffin I should bake for this picnic row. 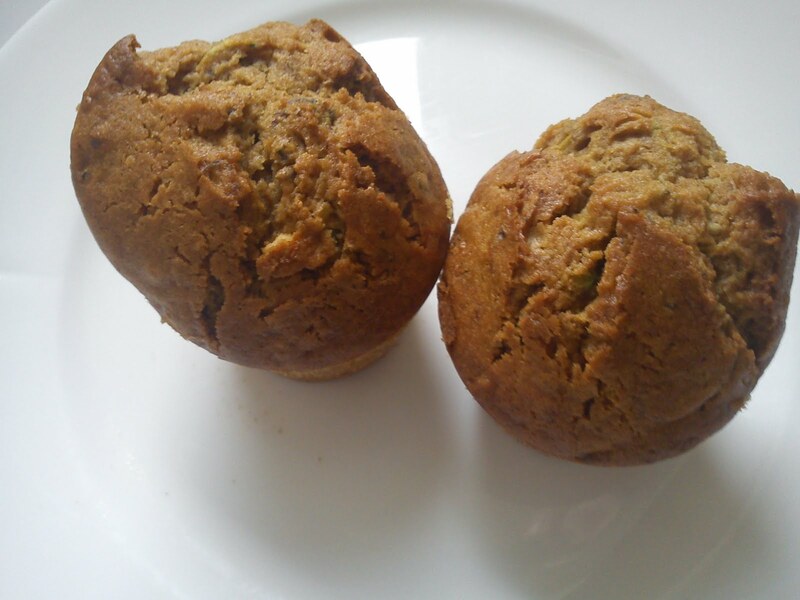 Should it a squash muffin, an apple muffin or a chocolate muffin ? So please help me making this decision by participating in the on-going vote on my blog. I never thought, that I would be in a situation, where I have had too much chocolate !!!! Is it actual possible to eat too much chocolate ? During my summer vacation in Switzerland, my friend and I went visiting the Cailler chocolate factory located in Broc (http://www.cailler.ch/en/Home.aspx). 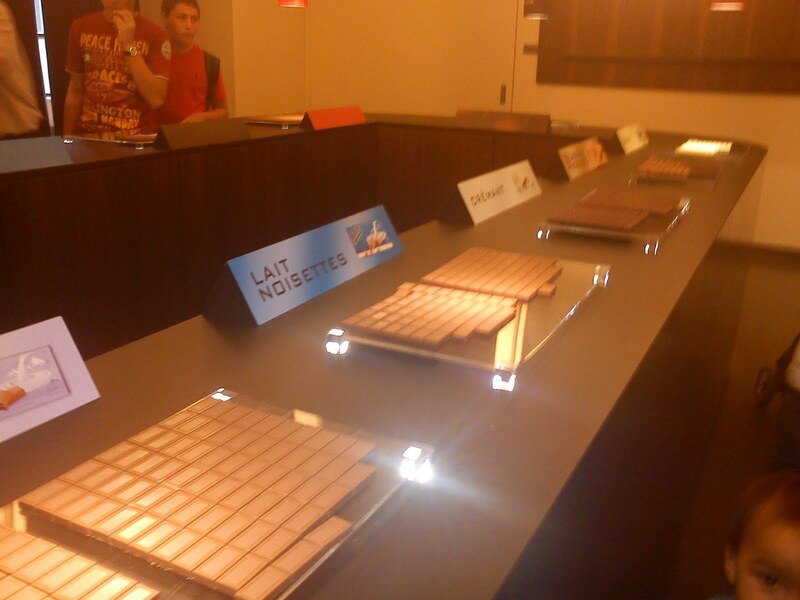 The visit starts with an introduction to the history of chocolate, where you can smell chocolate every where in the rooms. 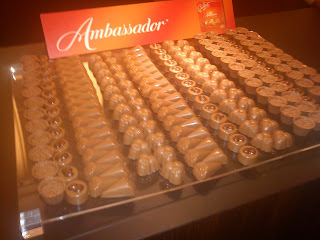 It is actual amazing to be guided around and being surrounded by the flavour of chocolate. 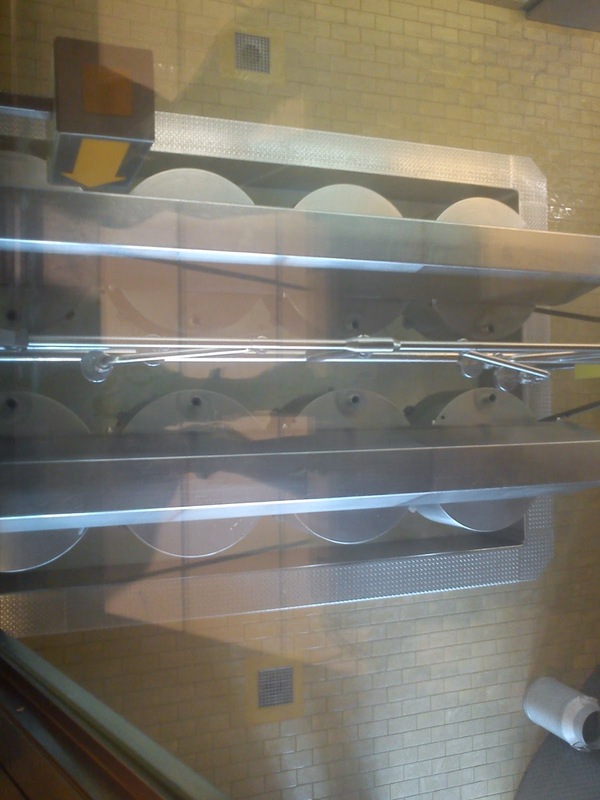 After the story of chocolate we could see as well as smell all the different kind of ingredients used in the production of chocolate. 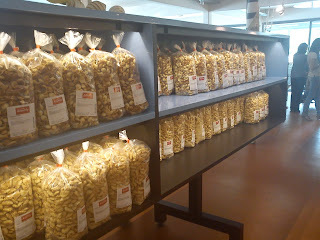 When we saw some part of the chocolate factory. At the very end of the tour we got into THE CHOCOLATE TASTING ROOM !!!! Or should you call it chocolate heaven ? And here we could taste many different types of chocolate produced at the factory. And the plates with chocolate were quiet big and you could try as many bites of chocolate as you wanted. Half way through the room my entire body was full, and it is was a bite of a struggle to taste the rest of the all the chocolate !!! As I briefly mentioned yesterday evening I have been visiting a good friend in Switzerland, which I have known since university, so it is a time frame of 23 years !!! While my friend had to spend her time at work, I went walking on a walking path with a wonderful view to the Alps, alpenpanorama weg nationale route 3, I only walked a small distance between Grosshöchstetten and Konolfingen. So I had to come up with a plan B, B for baker. I located a baker, which was open and not closed for lunch. 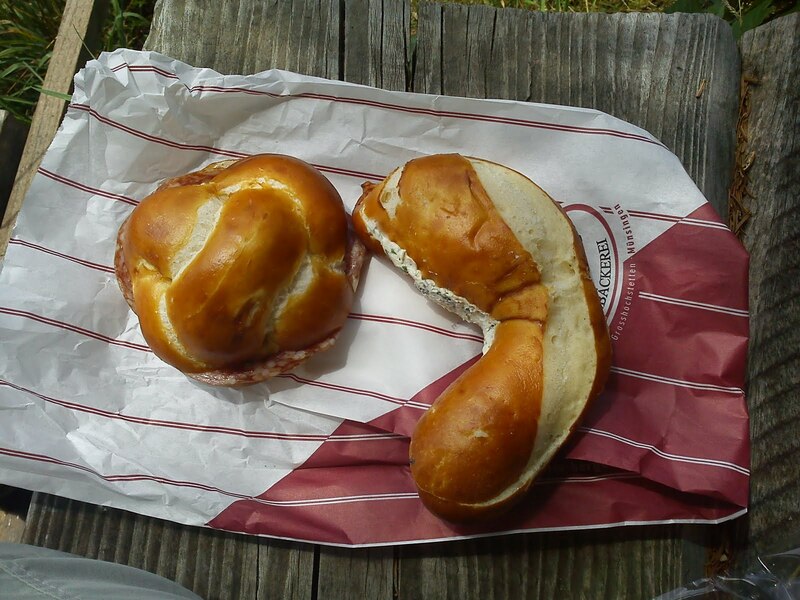 And here I brought two buns, one with salami and one with fresh cheese containing herbs. 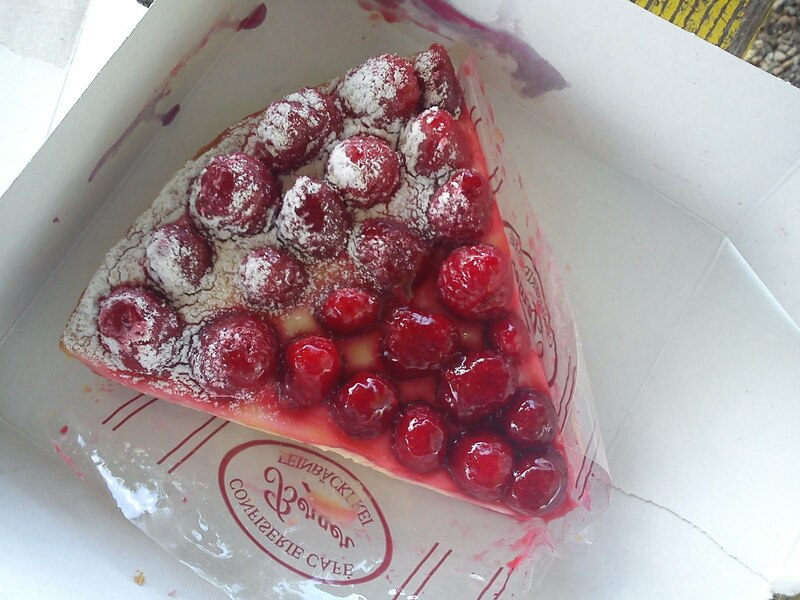 I also brought a mega slice of a fruit pie with raspberries. You could only buy the entire pie or this mega slice !!! The only other alternative was NOT to have any pie at all. And this was not a real alternative for me. 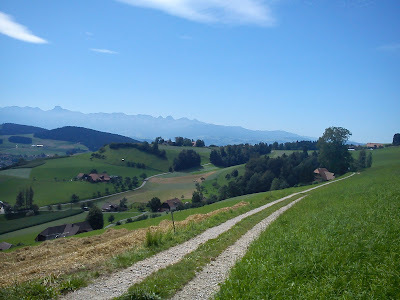 What to bring with you to Switzerland ? Are you also receiving shopping lists with "funny" food specialities from your friends ? 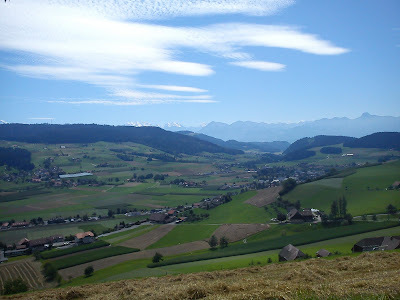 Very soon I will share my food experiences in Switzerland with you. I know two of my fellow rowers, who casted their votes on the same type of muffin, but they also had a hugh interest in this, as they were actually going to eat the outcome of this voting. So thank you very much to the rest of you voters, who played along in this gimmick without any rewards of their own (in form of a muffin). Lucky enough my two fellow rowers agreed with the majority of you, that the muffin should be made with rhubarb. 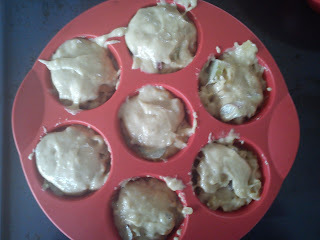 And they and the rest of the rowers of yesterday seem to really like these rhubarb muffin. It tasted great !!! 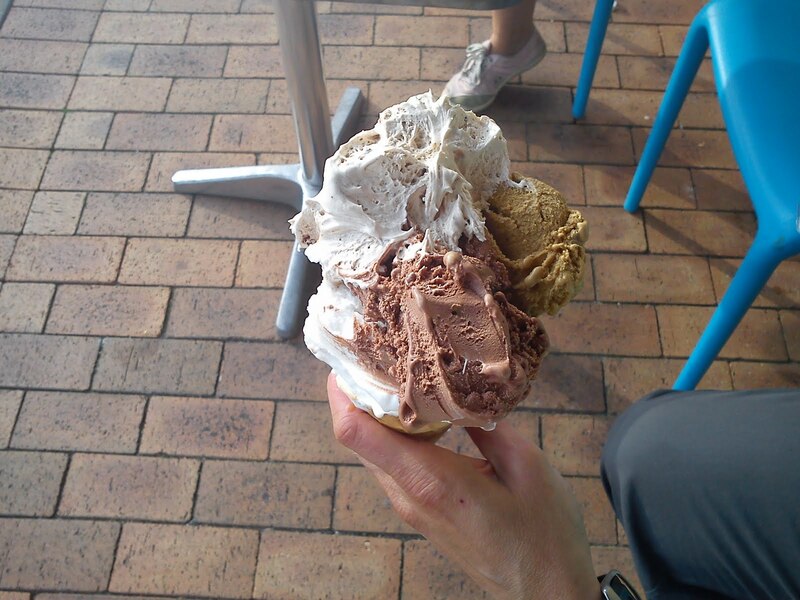 However, I wonder, what you as readers are thinking about these nutritional meals, we eat as rower such as ice cream for both lunch and evening meal !!!! These muffins are perfect for freezing (right after baking). 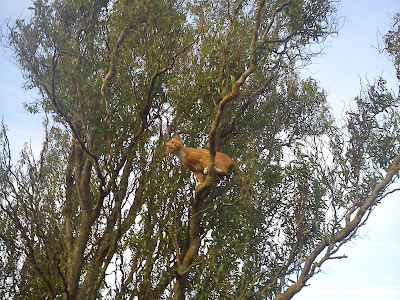 Hannibal the Cat on the look out for new blog posts about life in the kitchen and kitchen garden belonging to "his land-lady".﻿ As Hannibal the Cat not are able to vote on my blog, I hope you will use the opportunity instead of. I need your vote about, which type of muffin I should bake for a picnic row in the coming week-end. I am leaving it in your hands to make this decision !!!! (voting ended 5 August 2011). 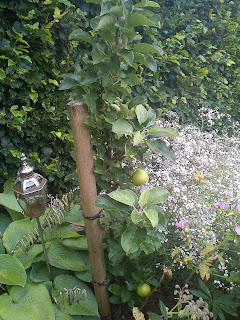 This blog post is actual blog post number 200 on my blog, so yet another mile stone, which I have achieved blogging about activities in my kitchen and kitchen garden as well as eating out. 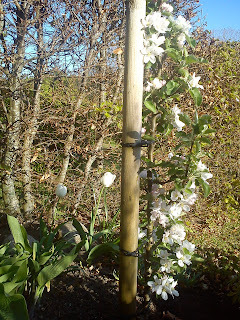 It is amazing to see, how popular the post about the blooming apple tree in my garden is. The apple tree was full many beautiful white flowers in April (the picture to left) and at the time being I will able to pick 3 apples later here in August (the picture to right). In the post about my blooming apple tree I also mentioned my raspberry bush having small flowers. And 2011 has turned out to the best year for harvesting my own raspberries, which I have used as topping on breakfast cereals as well as preserving them in raspberry jam, raspberry vodka and raspberry vinegar. My fig tree is not doing very well at all concerning growing figs. I have only found ONE fig on it, and it is very slow in maturing !!! It is very interesting for me to see, how a new post from mid-end of July month already has moved into a position as top 4. Here I am referring to the post about eating more or less nothing else than ice cream for lunch on a picnic row from Aalborg to Aabybro Dairy. And the post about making home-made yogurt has also managed to move into a top 5 position. I am planning to made other dairy fermentation in the kitchen here in autumn, so be on the look out for these. 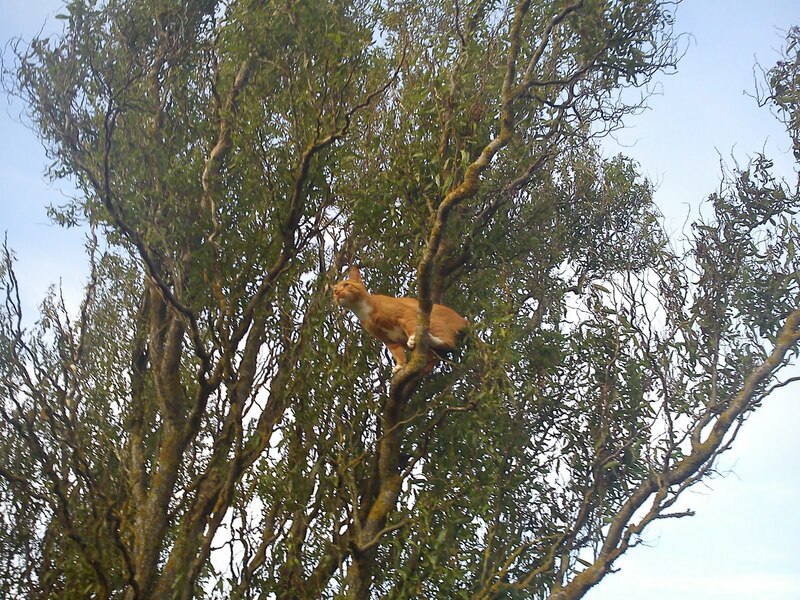 Perhaps not like Hannibal the Cat in a tree !!!! 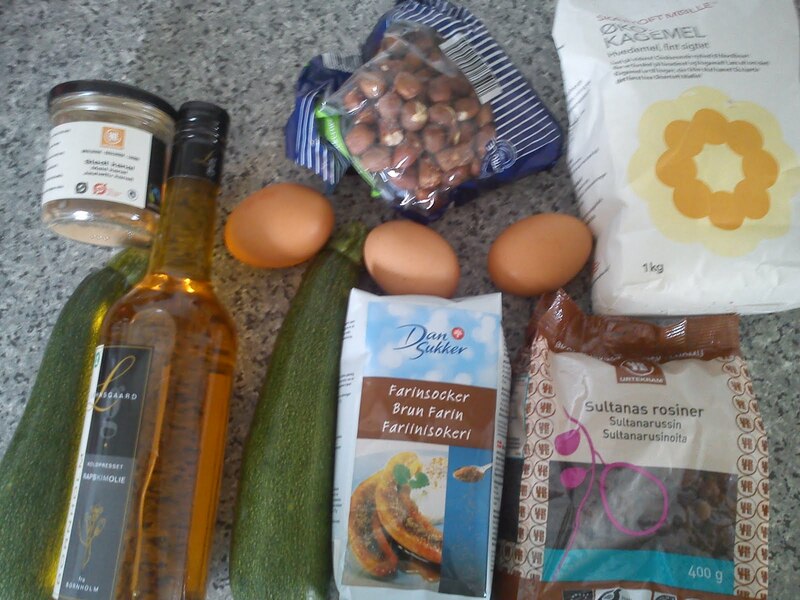 The actual starting point for me creating this blog was/is to bake my way through the baking book called "Hjemmebagt". Here it looks like, that I am in stand still position, as I have so fare baked 11 recipes out of 73 in total. And the last time I used this baking book was back in May month. I believe I will start to bake again after the summer vacation period is over. 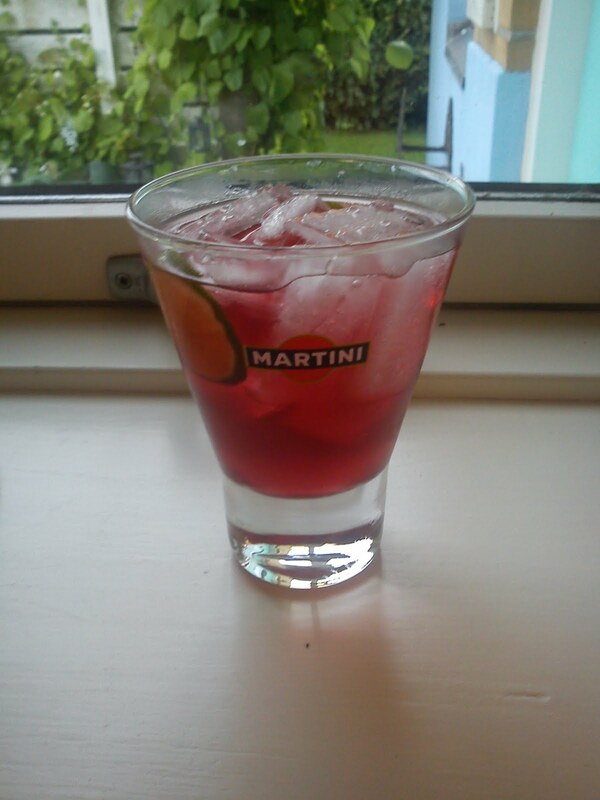 Meanwhile I have got "Almanak" by Claus Meyer as a birthday present, which I so fare have tried two times using raspberries from my kitchen garden. Together with some friends I have also been having our very own blog event in form of the very first selection process of THE BEST recipe for a specific dish. 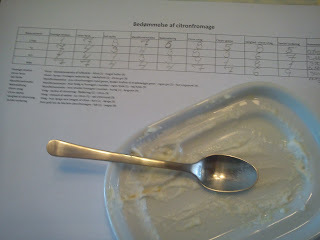 Here we started with lemon mousse (citron fromage in Danish). 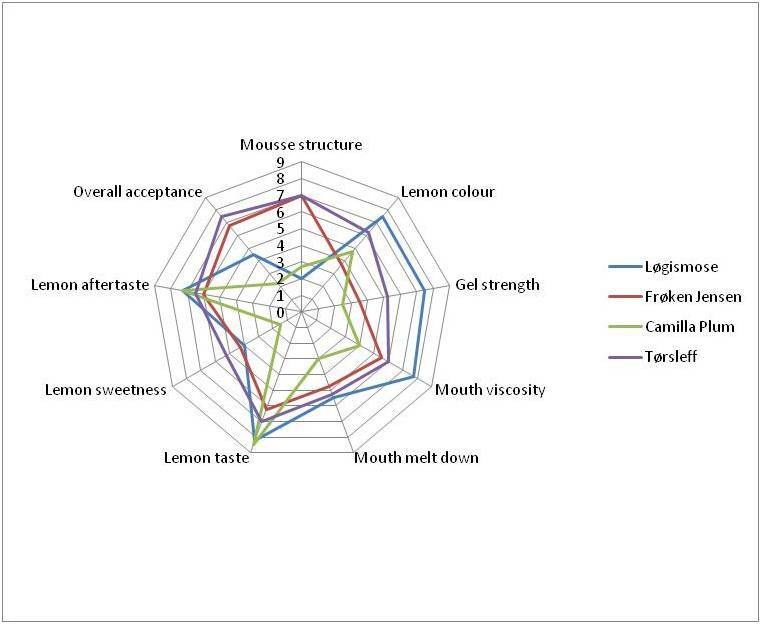 Next time we will remain in the lemon corner with focus on THE BEST recipe for lemon cake also known as lemon moon (citronmåne in Danish). At our lemon mousse selection process the lemon mousse recipe number 1 from Tørsleff´s dessert was chosen as THE BEST lemon mousse recipe. 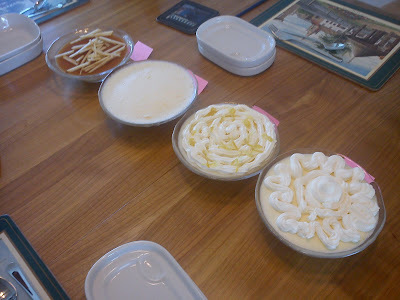 It was interesting to see, that we as tasters all had a preference for the traditional lemon mousse recipes. Wash the lemon - grate the peel of the lemon into very fine pieces. 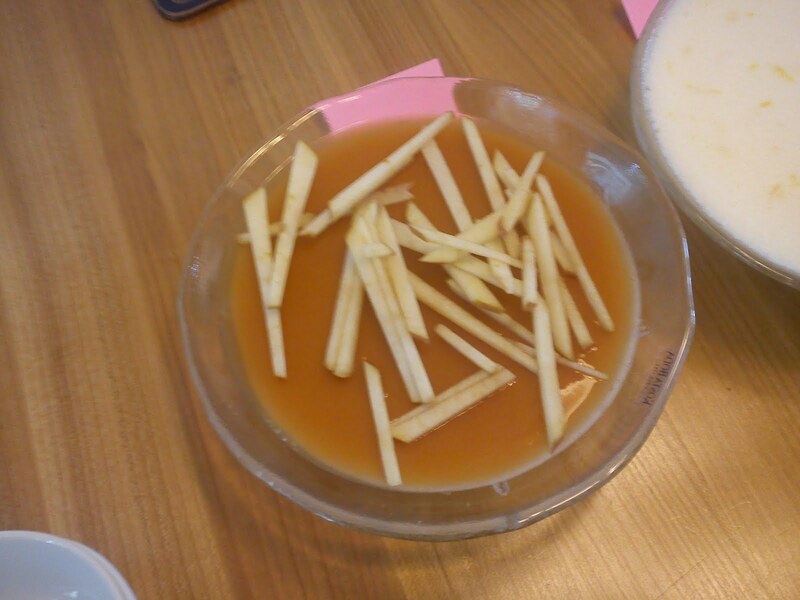 Place the gelatin leafs in cold water. Whip egg yolks, sugar, lemon juice and lemon zest together. Remove the gelatin leafs from the water, lets them melt in a water bath. Stir the melted gelatin into the egg yolk, sugar, lemon mix. 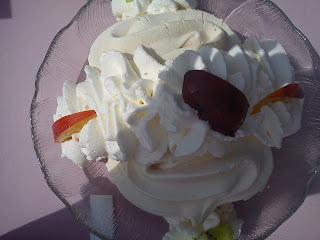 Agitate very, very well, as gelatin strings are very, very unpleasant to eat int eh final lemon mousse. Whip the egg whip stiff. Gentle stir the egg white into the egg yolk, sugar, gelatin, lemon mix. 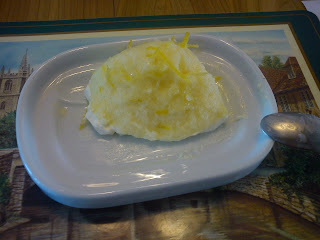 Place the lemon mousse cold in the refrigerator for 3-4 hours. Whip the whipping cream and decorate the top of the lemon mousse. First of all a BIG THANK YOU to Lars, who was very busy with making all these four lemon mousses to us :-). He did a great job following the recipes point for point without making any modification at all. The first lemon mousse on the menu was one created by Løgismose. a apple gel as top layer. 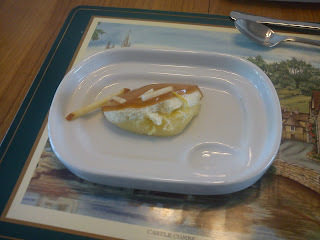 The lemon layer was not having any air bobbles at all and quiet firm like a wine gum. And the melt down in the mouth was slow. This new interpretation of lemon mousse was not liked at all by us as panel. The second lemon mousse was based on the traditional recipe, which you can find in the cooking book "Frøken Jensens Kogebog". This mousse had a airy mousse structure with medium melt down, good lemon flavour and medium lemon sweetness. This version was evaluated as the second best lemon mousse. The third lemon using the recipe from "Mormor Mad" by Camilla Plum did not have the normal cream topping. 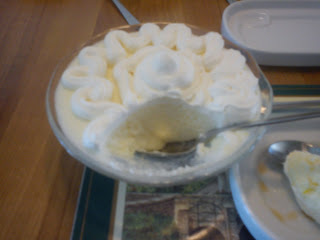 However, it had three layer in the actual mousse. A fluid quiet sour lemon layer, a layer with holes and layer full of air bobbles. It was the most lemon sour mousse with a lot of lemon bitterness. 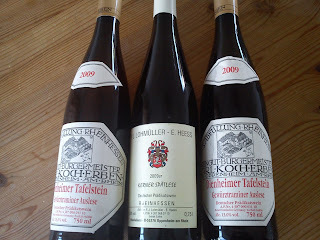 All in all the taste (sour and bitter) was disliked by the entire group of tasters. 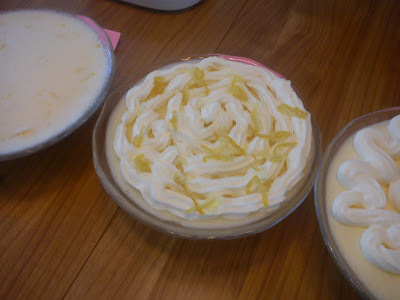 The last mousse tasted turned out to the preferred lemon mousse due to it´s airy structure, medium melt down, a good balance between sweet and sour. This lemon mousse was made using a recipe from the yellow dessert book by Tørsleff. I will share this recipe with us later on in this week. 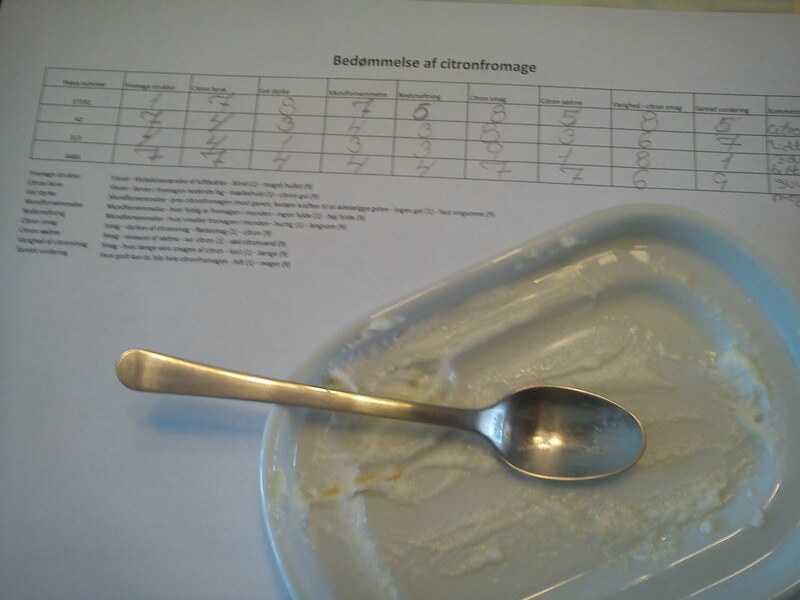 And the next selection process of THE BEST recipe will be made with focus on lemon cake also known as lemon moon or "citronmåne" in Danish. But we are talking winter time 2012 before we will endure a tasting session on lemon moon !! !